In order to study effectively it is worthwhile to learn how to manage your study and having a plan in place, which helps you to work out a weekly routine of study throughout the school year. Staying motivated to see the plan through however, is really important. Many students will experience a dip in motivation at different times of the year, however you need to keep focused on your ultimate career goal to motivate yourself to get the necessary results. A study plan is a personal, workable and flexible timetable designed to meet your specific needs, including lifestyle and attention span. 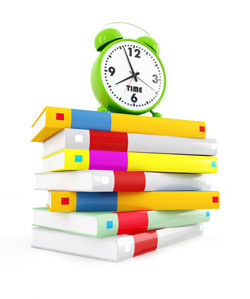 It can be designed as a daily or weekly study aid, which should have specific study related topics and tasks listed. It will need to be flexible as unexpected things happen all the time to mess up the best of plans. Know yourself! for example, do you study better first thing in the morning, directly after school or in the evening. Does your concentration begin to lapse after 20 to 30 minutes? Being aware of these factors can help you put a realistic plan together, which should include short breaks after each block of study. There are many study aids such as mind maps, summary sheets, flash cards, to do lists or brainstorming answers which can be used to enable you to achieve the most from the time you have assigned to study. Practice questions from previous exam papers will give you invaluable experience in writing for an exam and can also help identify information gaps for yourself. Planning study, mastering exam technique, meeting deadlines and completing application forms can also be a very stressful time. Taking breaks, having some time out from study and generally looking after yourself is also essential, especially coming up to exam time. If you feel you need some help, do ask. Your teachers and guidance counselor are there to support you. If you would like individual assistance planning your study please contact me to arrange an appointment.